It is what is says, the last game in the R-Type franchise and it sure has gone out with a bang, no pun intended. What has been a reliably good representative of a genre has decided to call it a day and will be sorely missed. I was always a fan of R-Type for the simplistic knee jerk skills that you had to have to shoot down all the bad guys. Whilst there was very little in the way of story, you never really needed one to get in and have some fun and the best thing about it was that you didn't have too much to figure out either. Get powerups and shoot, shoot, shoot! Making itself as accessible to any audience as possible, RT has a difficulty setting that will allow your absolute novice through to your experienced gamer to enjoy this title and the challenges that it represents. The gameplay is straightforward and filled with the action that one has come to expect from this great series. As always, your focus is one weapons and the powerups that you can get as you make your way through the game. You start with standard blasters, however it's only a matter of time before the weapons of mass destruction get pulled out to play. One thing that you must be aware of with this title is that you need to experiment with your ships and their weapons as there are more than just the one way to get through a particular level. With the right ship and right weapon you might be able to blast through walls to open up a new area or passage. It's this sort of innovation that gives the game a bit more life than it six or so levels would actually give you. Graphically this is the nicest looking R-Type game to date which makes sense being it's first and last game on a next gen console. Colours are vibrant and level design inspired. 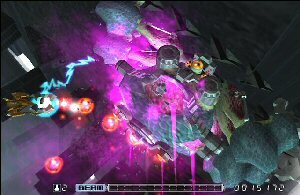 Weapons fire looks great as do the bosses that you will have to face at the end of a level. 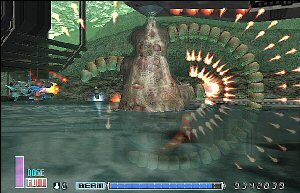 Being a Japanese designed game means that you do see some quite freaky designs and the final end boss arena has to be seen to be believed. Hint: Check out the silhouette for an example. Progression in the game is fairly simple with a number of fighters already available for you to select. Successful completion of levels and tasks will unlock a huge amount of other ships that you can use in order to get the job done with the least amount of hassle. All of these have different weapons and the powerups that can be added to them makes fighting the good fight even more fun. One of the things that must be mentioned is that R-Type has stayed true to it's roots in terms of gameplay and for those of you who are already familiar with it, there's no learning curve at all. And for the rest of you, there is hardly anything to figure out anyway! 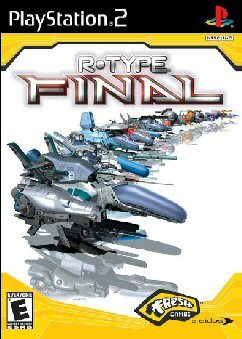 It's sad to see the last of this tried and true series, however at least it can be said that R-Type is going out with it's head held high. This series has been an absolute blast and I can highly recommend that all gamers will have a ball with this game. It's the sort of fun that I recall from back in the day of going to the fish and chip shop where they had the first space invader machines. This game is in the same vein and won't let you down for an entertaining experience. Give it a shot!